In the exercise earlier in this chapter, we demonstrated how a woman's attitude and her internal dialog can dramatically affect her outward seductiveness, simply by making her feel more seductive. At an even deeper level, our attitudes affect the way we perceive the men in our lives, and thus, how we act toward them. The key word in this whole process is intent. How we feel toward men in general, and the man we are with in particular, has a great effect upon our behavior, even in ways of which we are unaware. These attitudes may be the product of our past relationships, or may even be deeply ingrained into the very fabric of who we were at birth. Your intent toward another person is comprised of all your hopes, fears, past joys, and past pains. Though intent makes up a significant portion of a person's attractiveness and allure, people frequently give little consideration to what that intent is. We want, without understanding what we want. We seek tokens for reasons we never consider. It follows, sadly, that if we are unable or unwilling to consider our own real needs, it becomes natural for us to not consider the needs of our partners. Our intent toward the other person becomes narcissistic and destructive. 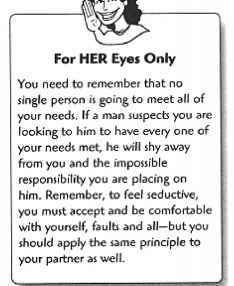 For HER Eyes Only if a man feeli he ft pleating you, he will, himself, be pleased. If he believes he it making you happy, he will feel happy, too. This may sound like a sexist statement, but it's true. Ask yourself how many couples you know where ihe woman is miternble, yet the man is really happy, There juit aren't any. So if you expect men to want to be with you, you'd better Jet them know that you enjoy being with them. For better or for worse, your intent will be projected to the men you want to attract, either adding to or subtracting from your seductiveness quotient. Without lifting a finger, you can make or break the enchantment. The good news is that if you're projecting a less than enchanting persona, you have the power to change it. It's all up to you. In the final analysis, we women are real winners in the seduction game, because the better a man is at pleasing us, the happier he is. Just by enjoying ourselves when we're with a man, we go a long way toward ensuring that he is enjoying himself, as well. And by feeling more seductive, more alluring, we actually become more alluring. No matter where you go, you aren't likely to find a better deal than that. So go out, have a wonderful time, and dazzle the men in your life in the process! > You wfil be enticing if you look and act sensual, real, and touchable. The Ultimate Seducer: A Woman's Perspective. > Leaving the strong, silent type in the movies where he belong? Among the many surveys that I conducted with clients over the years, perhaps some of the most enlightening responses were to questions about what actually constituted attractiveness and allure. In Chapter 7, we presented a guy's-eye view of a seductive woman. Now it's your turn, guys, to find out the answers to the burning question: What makes a man seductive to women? You might expect that the women I surveyed would have named qualities such as physical appearance, intelligence, and affluence as the most critical factors in defining a seductive man. To my surprise, however, these factors rarely appeared at—or even near—the top of most women's lists. The majority of the women who responded were more concerned with the fundamental qualities in a man's attitude than they were with his outward appearance or his accomplishments. Despite what the media would have us believe, substance really does take precedence over style where women are concerned. Our primary objective in this chapter is to help you guys become more aware of your own unique substance, and polish those aspects that women seem to almost universally appreciate. At the same time, we'll concentrate on minimizing those behaviors that, even though they may seem insignificant to a man, are sure-fire ways to turn women off.